Who left the garage door open? We have a full house with a lot of activity and visitors. There have been several times when the garage door is left open for extended periods of time. While our Christmas decorations and paint supplies may not be a treasure most would be thieves would desire, it is still not the most comforting thing to think about leaving the garage open for all passerby to see. I often thought it would be great to have a way to notify whoever is in the house that the garage is open. 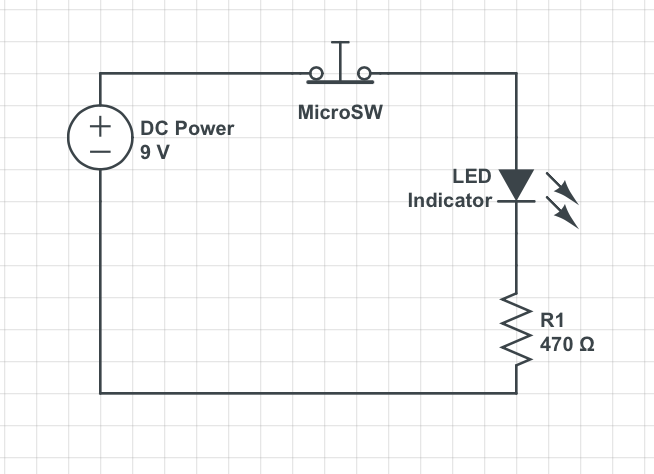 I decided that my first step would be to design a way to detect “door open” by providing a simple indicator light. I explored a few optical ways to do this (light beam, camera, reflectors) but quickly pivoted my approach when I found some unused microswitches. I found a good place to detect “closed” on the main track. 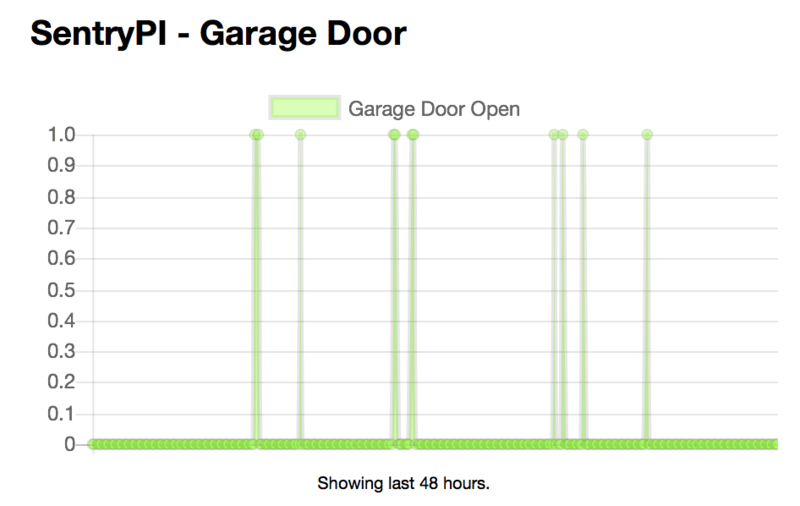 I thought about piggybacking on the garage opener sensors but dismissed that as I didn’t want to risk an undesirable interaction with the opener and more importantly, I wanted to have the detection work even if power to the opener was interrupted. This required that I build a bracket to mount the switch to and a ramp plate to compress the switch when the door was in the down position. 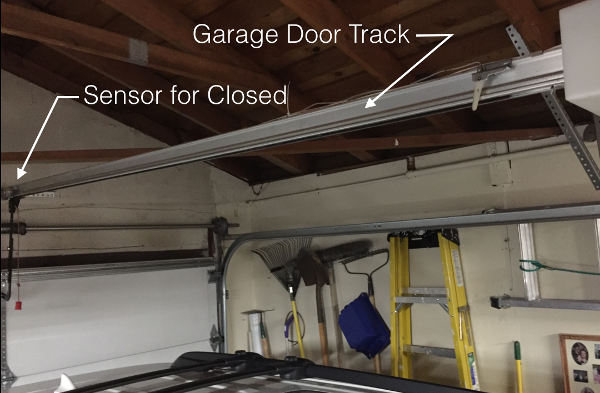 I used an aluminum sheet, cut with sheet metal snips, bent and drilled holes to mount the microswitch and eventually attach it to the garage door track. It took a few tries to get the right fit and right placement of the micro switch. My first attempt destroyed the microswitch after a few uses. 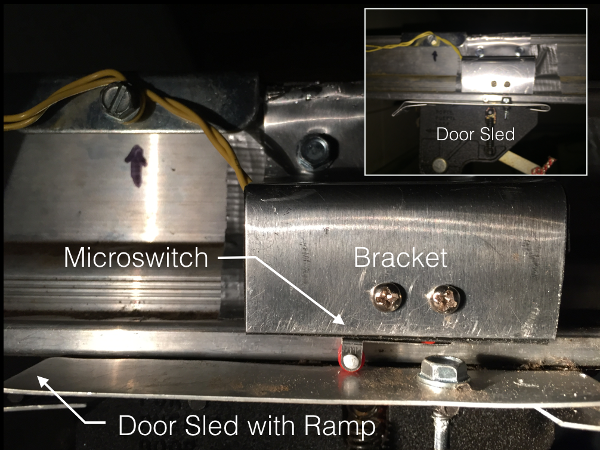 The garage door track sled has a straight edge that collides with the microswitch roller. It created too much force on the small roller and eventually popped it loose. 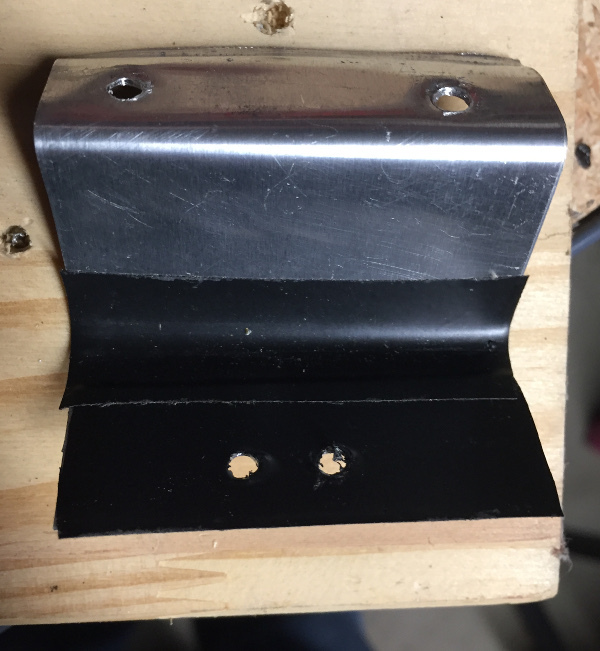 To help with that, I added an aluminum ramp to the sled so that the microswitch roller would gently rise as the sled entered the “closed” position. 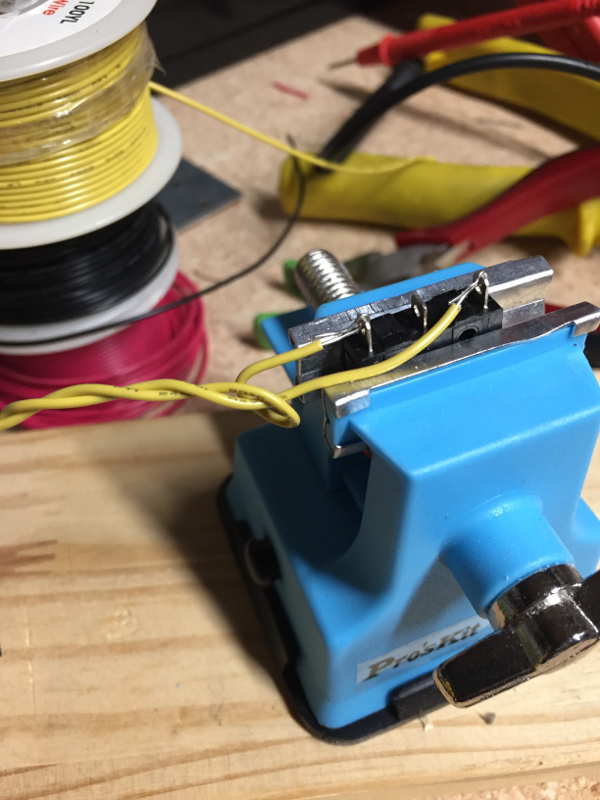 I decided to make the “door open” state be the closed circuit condition so that phase 1 of the project could start as a simple LED circuit indicator. I attached the switch and drilled some pilot holes and mounted the bracket to the garage door track right above the sled when the door is in the closed position. 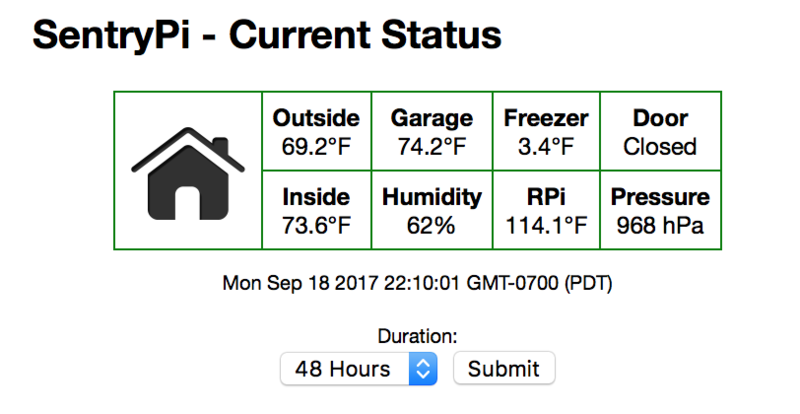 Now that I have a working “door closed” sensor and indicator, I am ready to add the proactive home automation component, specifically the Raspberry Pi (RPI). It just so happens that I have a spare RPI Model 3 that needed a project, and I wanted to experiment with AWS IoT services. I used the RPI to detect the state of the switch. To do that, I will need to wire the circuit into the RPI’sGPIO headers. 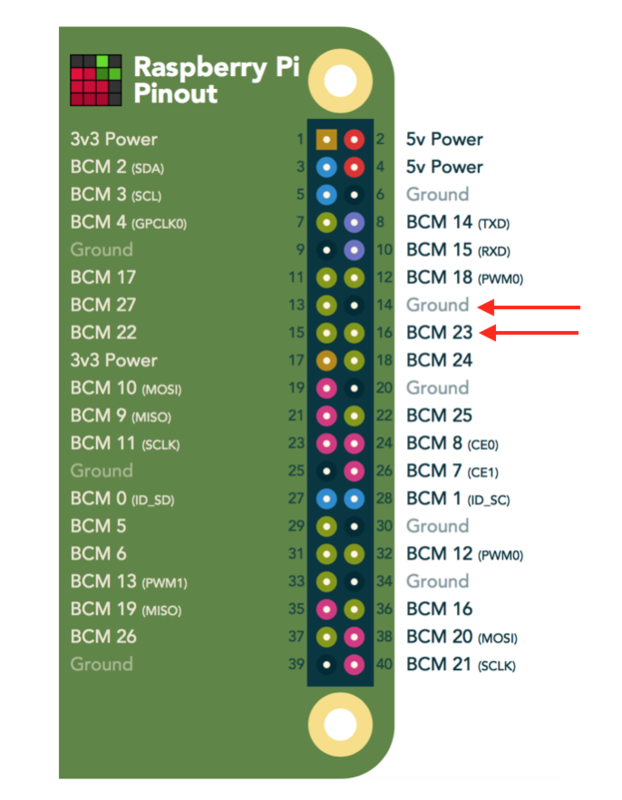 I decided to use GPIO Pin 23 and the adjacent ground (GND) pin. print "Sentry Activated - Watching: GPIO 23"
The next step was to connect to AWS IoT to record this sensor data and send alert messages to my phone. The following will help you set up your Raspbery Pi as a platform to install the SentryPi scripts. Sentry Alert – Send a text message to contacts when an alert condition is reached. Dashboard – Provide an automation dashboard for realtime status. This is a great book to remind us of the purpose of engineering and the dangers we face when designing technical bridges (and physical ones) across the unknown. Petroski wrote this in the early 80’s and the examples and illustrations are sometimes dated but still practical. I found the section on computers, “From slide rule to computer” to be particularly interesting. His case still hold true for the faster/newer techno-driven culture of the 21st century. Engineering is very dependant upon feedback for improvement. The goal of providing a design solution for the lowest cost will mean that materials, processes and other costly items will be minimized to achieve the most economical/efficient solution. Unfortunately, there are things that we do not know about (the trite, “we don’t know about what we don’t know” phrase comes to mind) that can be or become significant issues in the design. The Tacoma Narrows Bridge is a great example of this. Engineering attempts to introduce “safety factors” into the design model to cover for the unknowns but this can often be inadequate, as was the case of the walkway collapse at the Kansas City Hyatt Regency Hotel. Failures, while unfortunate and often deadly, should also be opportunities for improvement. Petroski argues that it is important that details of failures be broadcast to provide corrective feedback to all engineers so that future designs will build on these learnings.